Why does it take my dryer 3 hours to dry a load of clothes? I have a Maytag model LD69806AAE clothes dryer. Since our tenants in our town home have moved in July 2012. They have pointed out that the dryer takes about 3 hours to dry a load of clothes. The dryer is about 10 years old but was not used that much. The previous owner (my wife's GF) hardly used it. My wife bought the place in 2006, and before I moved in when we got married in 2009 it was hardly used. She had two roommates at separate times but they only stayed for months at a time. The dryer is located in the center area of the first floor. There is about 28 feet of flex corrugated dryer vent duct work. It is routed to the outdoor patio. There are about 3 elbows in the duct run. The duct ended at a louver/grill at the exterior patio wall. Here’s a list of things we have done. Had Sears replace the heating solenoid valve. My brother-in-law and I vacuumed the inside of the dryer and ductwork at the point of connection to the dryer. Replace the outside termination to a typical wall cap. Remove some excess flex duct close to the outside termination. Now we are considering re-routing (21 feet approx.) the ductwork with straighter runs and less elbows and provide smooth dryer vent ductwork and possibly increasing the duct from 4” to 6” at areas where possible. Will this make any difference? Some HVAC discussions suggest flex duct has a 50% flow reduction compared to smooth. Your duct is probably too long, and not constructed properly. Installing a proper exhaust system may increase the dryers performance, though this is not guaranteed. Vent length and installation requirements will vary slightly from manufacturer to manufacturer, but International Residential Code (IRC) gives us a conservative starting point. M1502.1 General. Clothes dryers shall be exhausted in accordance with the manufacturer's instructions. M1502.4 Dryer exhaust ducts. Dryer exhaust ducts shall conform to the requirements of Sections M1502.4.1 through M1502.4.6. M1502.4.1 Material and size. Exhaust ducts shall have a smooth interior finish and shall be constructed of metal a minimum 0.016-inch (0.4 mm) thick. The exhaust duct size shall be 4 inches (102 mm) nominal in diameter. M1502.4.3 Transition duct. Transition ducts used to connect the dryer to the exhaust duct system shall be a single length that is listed and labeled in accordance with UL 2158A. Transition ducts shall be a maximum of 8 feet (2438 mm) in length. Transition ducts shall not be concealed within construction. M1502.4.4 Duct length. The maximum allowable exhaust duct length shall be determined by one of the methods specified in Section M1502.4.4.1 or M1502.4.4.2. M1502.4.4.1 Specified length. The maximum length of the exhaust duct shall be 25 feet (7620 mm) from the connection to the transition duct from the dryer to the outlet terminal. Where fittings are used, the maximum length of the exhaust duct shall be reduced in accordance with Table M1502.4.4.1. M1502.4.4.2 Manufacturer's instructions. The size and maximum length of the exhaust duct shall be determined by the dryer manufacturer's installation instructions. The code official shall be provided with a copy of the installation instructions for the make and model of the dryer at the concealment inspection. In the absence of fitting equivalent length calculations from the clothes dryer manufacturer, Table M1502.4.4.1 shall be used. Basically what all this means, is that in general the overall length of the duct can be 33'. 25' of the duct system; measured from the exhaust hood to the dryer connection, must be 4" rigid metal duct. You can then have an 8' section of "transition duct", which can be flexible duct, but must be UL listed and labeled for the use. For each elbow, subtract the value from Table M1502.4.4.1 from the overall 25' length. When you use flexible "transition duct", make sure the duct is fully extended and trimmed to fit. Don't leave the duct compressed and coiled. 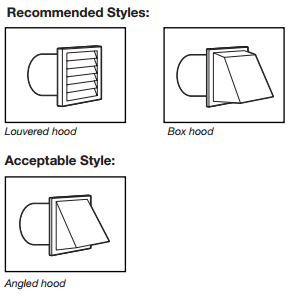 If you look at the Maytag installation instructions (PDF), they tell you what type of exhaust hoods you can choose from. 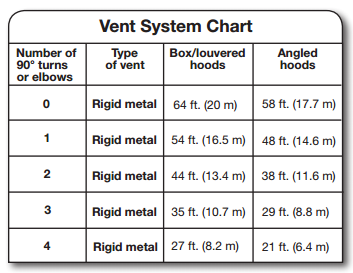 The instructions then provide a table to determine the maximum duct length, based on the hood used and the number of bends. Gas dryers need gas to dry, so make sure the gas is on before you spend too much more time or money on repairs. It might also be useful to make sure it's not user error, by making sure the tenants know how to use the dryer properly. Don't forget to make sure the tenants aren't overloading the dryer. I would start your repair process by running a very temporary hose out a window and comparing the dry time of a damp towel (wash two, dry one and hold the other in a plastic bag for your test). Separate out the possibility of a bad sensor from the duct issues. For running the duct: hard duct is better than flexible, and long sweep elbows (e.g. dryer-ell brand) are better than typical elbows. You'll have to give us pictures if you want help routing the duct. Your Maytag technician should not have speculated about back pressure on the ducts, but rather measured it and given you a number. A lint alarm on the dryer is a good idea for rental property, and those will give you some rough indication of back pressure, but nothing particularly calibrated.